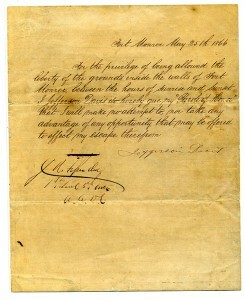 Pledged signed by Jefferson Davis at Fort Monroe, dated May 25th 1866. This collection includes over 500 pieces of correspondence relating to Jefferson Davis, president of the Confederate States of America, and Confederate generals, including G.T. Beauregard, Braxton Bragg, Samuel Cooper, Joseph E. Johnson, Robert E. Lee, James A. Seddon, E. Kirby Smith, Richard Taylor, and William H. Thomas, among other noted figures of the Civil War and the mid- to late-19th century. Correspondence of Varina Davis, Mary Randolph Custis Lee, and Mary Custis Lee, together with some photographs and other pieces of ephemera, can also be found in the collection. The majority of this collection was donated to Miami University in 1960; other items were acquired more recently as a result of an endowment that provides funds to purchase important items complementing the contents of the original collection. 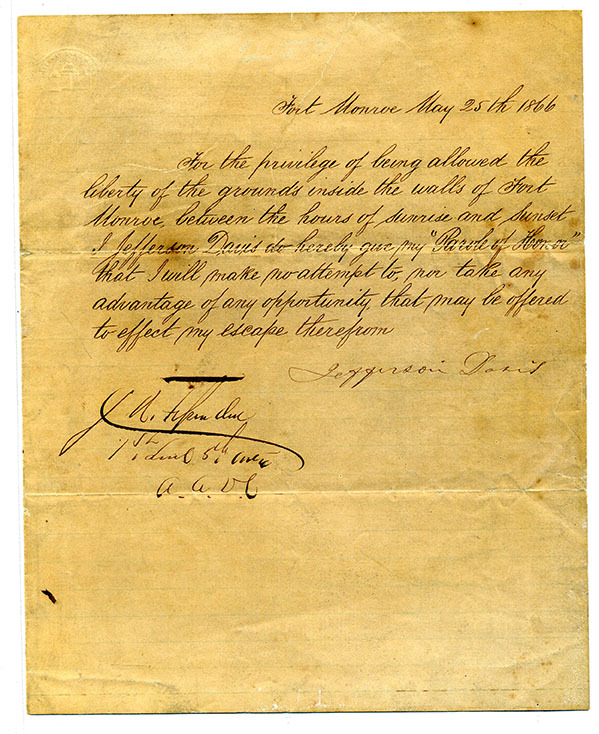 This collection includes documents that were written by staff officers, clerks, and Confederate officers, as well as civilians, both during and after the Civil War. Of the more than 500 documents comprising the collection, 218 items relate directly to Jefferson Davis, president of the Confederate States of America.